Despite two years passing, Captain Keondric Morgan has never forgotten the lass who left his ship so heartbroken. When a crewman’s deathbed confession reveals her fiance’s demise was the result of murder, the captain knows he must try to contact her. But his attention draws the notice of others as well–dangerous men who believe Tillie has in her possession something that could expose their crimes. And to their way of thinking, the best way to prevent such an outcome is to seize the evidence and then hand Tillie the same fate as her naive fiance. I enjoyed Dark Road Home, the first book in the Edge of Freedom series, so I was especially excited to dig into Tide and Tempest. The opening scenes flowed fast, and again I found myself immersed back in 19th century New York, becoming reacquainted with Tillie McGrath and getting to know Captain Morgan. The Celt is back, along with the Irish Fenians, and the complicated plot around a special ring chugs ahead, full steam. A couple years before, Tillie had sailed with her fiance from Ireland on Captain Morgan’s ship. When her fiance died onboard, she felt that she deserved God’s punishment. She worked as a milliner by day, and volunteered at a shelter most nights, trying to earn God’s favor. I appreciated the underlying message, a subtle thread throughout the book, that grace and forgiveness is a gift, not to be worked off or earned. Captain Morgan had never been able to get Tillie off his mind, and commits to protect her until they discover her fiance’s killer. Tillie and Morgan were totally lovable, even with their occasional rash actions. As I noted in my review of Dark Road Home, I definitely recommend reading the first book in the Edge of Freedom series, No Safe Harbor before picking up the next two books. The plot and most of the characters played out through the entire series. If you love historical romantic suspense, you’ll want to include all three books in your personal library. 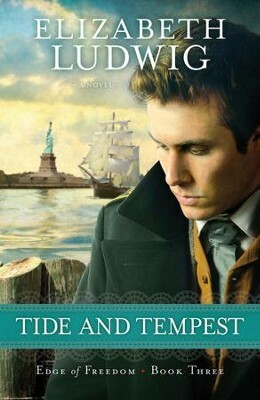 Disclaimer: Sending a big thank you to Elizabeth Ludwig and Bethany House Publishers for providing me with an advance review copy of Tide and Tempest. The opinions expressed in this review are my own, and I received no monetary compensation.